← BLOG: It’s finally here: Tia’s SECRET Pillowcase for YOU and Your Loved Ones! No doubt about it, life is going to get you down from time to time, but what’s important is to bounce back up again. And, we are the ones who need to lift ourselves up, not depending on others to do it for us. Realizing that is having The Inside Advantage! Sometimes simply remembering a very happy time is all that’s needed to bring a smile to your heart. Like everyone else, my life had very sad and painful times—physically and emotionally. Thankfully though, I also have thousands of happy memories. I use these to lift myself up when feeling down and hurting. It was a cold January evening and I was so excited about getting my very own first car. I occasionally drove the family car when I was a teen, a bright red Mustang, and shared cars with my husband over the years. But this car was going to be MINE! 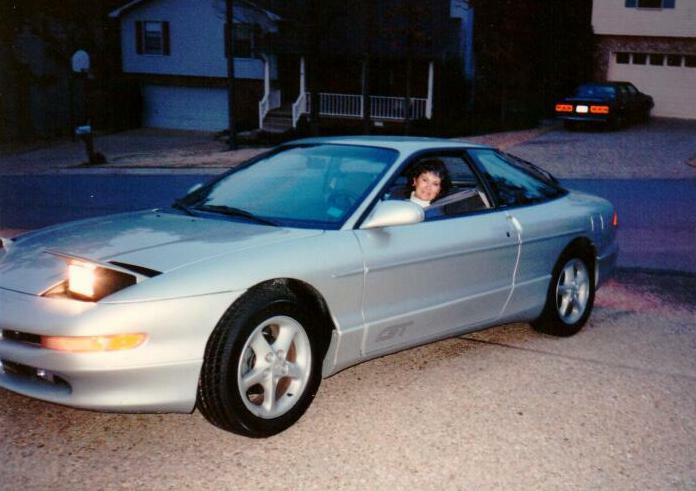 The one we ordered was a sleek silver 1993 Ford Probe GT with a moon roof – what a beauty! I’m told this was the fastest production car in 1993 going up to 140 mph. The dealer called and said it was ready for pick up; we wasted no time getting there. By the time the paperwork was finished it was dark outside. There she was, sitting right there waiting for me, and I loved her at first sight! I climbed into the driver’s low-to-the-ground bucket seat. Wow! I’m smiling now thinking of those first moments—the new car smell, looking at the console and dashboard with all the fancy knobs, dials, and buttons… I listened to sound of the V-6 engine as I turned the key and opened the moon roof for the first time. I turned the lights on and saw the headlights pop up. I rolled down the windows and looked up through the moon roof at the stars; it was such a beautiful night! I pushed the PLAY button and heard Lily Was Here by Candy Dulfer, a jazz saxophonist. I love jazz and this meaningful gift made a special night even more special. I turned the volume way up and felt the sounds’ vibration touching my heart in an extraordinary way. As I stepped on the gas and drove on the highway, the cold winter air blew across my face and in my hair. When I came to the long bridge over the wide river, I floored it; my head jerked back against the headrest and I laughed out loud. I don’t know exactly how fast I was going, but I was flying — faster than I had ever driven before! It was certainly exhilarating! Whenever I want to lift myself up, this is one of the many times that I can always remember, knowing it will put a smile on my face and in my heart. These are moments of joy that never fade. Whenever I close my eyes I an still feel the rushing cold air and the powerful engine, I can still see the stars in the dark sky above, and I can still hear the music. I can still feel those same feelings whenever I let that memory fill my mind, body, and soul, and for that I am so very grateful! Go to CWLauro.com to find out what name I gave my car and how long I kept her. This entry was posted in Creating a Successful Life, Joy, Lifting ourselves up, Living deeply and tagged Bouncing Back, Candy Dulfer, Cathy W. Lauro, celebrating life, feeling better, Ford Probe GT, happy memories, jazz, lifting ourselves up, Lily Was Here, living deeply, living in the moment, red mustang, savoring the moments, saxophone, successful living, The Inside Advantage. Bookmark the permalink.